Place LiveChat on your Weebly website and start chatting with your website visitors. This installation process takes just a few minutes. You will be answering questions from potential customers in no time! First, log into your Weebly account and click on the Edit site button. Now, go to Apps section, available at the top of your website editor. While in Apps, type LiveChat into the search tool and hit Enter on your keyboard. To proceed, choose LiveChat from the list of available plugins. On the next section, click on the Add button, available at the right side of LiveChat’s description. Click on Connect to finalize the process of adding your LiveChat app. 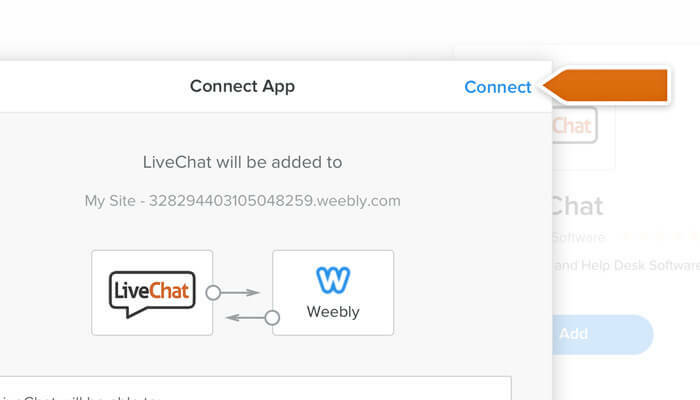 All that is left now is to link your LiveChat account with Weebly. To do that, click on Sign in with LiveChat. In the new pop-up window, provide your LiveChat credentials and click on Sign in button. Once your LiveChat is connected, you should be taken back to your website’s editor. To finalize the process, click on the Publish button. Congratulations! LiveChat is now added to your Weebly site. Start chatting with your visitor by downloading one of our apps, available here! Hopefully, you have found this article helpful but if you have any additional questions, feel free to start a chat with us. Our Support Heroes are available 24/7/365!